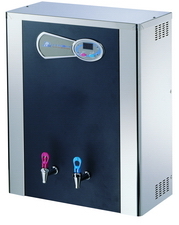 A Cold and Cold Water Dispenser with Capacity of Hot (20 Litres) and Cold (8 Litres), suitable for high usage industrial and office areas. High heating power: 2400W. Hot water is offered continuously. Entire body is made of stainless steel, which is durable and resistant to rust. 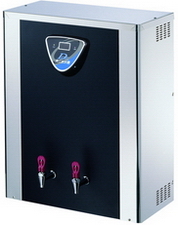 Digital System The heating system is controlled by digital controller Temperature Display via LED Display Constant Temperature When hot water temperature is down to 97℃, the system will heat the water back to 100℃ automatically. Internal Water level Sensor Automatically replenishing water when water is used. Cutting off the power supply automatically when water source is shortage. Cutting off the water source automatically when power is off. User won’t drink any un-boiled water. High heating power: 4800W. Hot water is offered continuously. High heating power: 3600W. Hot water is offered continuously. CJ-5L is suitable for government buildings, schools, factories, hotels, restaurants or public areas where there is the need for constant hot water.